Uh-oh: The end of Florida as a tax haven? A lot of friends have packed up and moved to Florida. Some say it’s because of the winter weather. Most concede that it’s because of the favorable state tax structure. 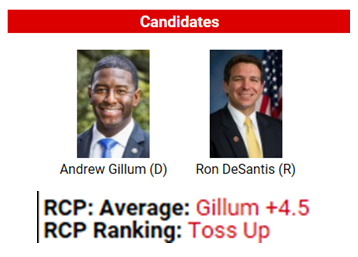 Andrew Gillum is a far left progressive … even to the left of Bernie Sanders. He advocates extensive government spending on social programs … think: Medicare for all and expansion of Medicaid. His campaign is built around the “power of free”. It’s relatively silent on the details of paying for the freebies. So it surprises me is that I haven’t heard any chatter about the inevitable rise in taxes if Gillum gets elected governor. Maybe, the FL legislature will still be controlled by the GOP … containing any tax increases in the short-run. But, eventually the tax piper will need to be paid if the majority of Floridians vote for big spending. All of which raises the question: what happens when a tax haven turns Blue.